Incorporating next season’s new crest, this badge will superbly accompany any other match-day accoutrements. Badges can be purchased on the coach to matches. 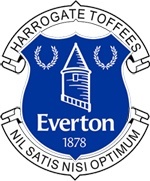 Interested non-Supporters Club members can get in touch with us via Twitter – @Harrogateblues1 – and we’ll arrange to meet up before a home match.